Hi, I'm hoping I may get some advice on this piano. It will be a first piano primarily for my daughter to practice on and maybe I will learn too. 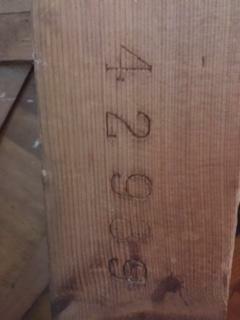 It is a Rogers Upright serial number 42989 which I believe dates it 1930-1938 according to a web-site I found. I believe from the research I have done that it is a reliable manufacturer and rates 55-70 that is fair to excellent obviously they will vary in quality. It has been played regularly and the family currently play it. The music stand needs repair but otherwise good working order. Can anyone tell me if it is underdamped and overstrung from the pictures please? And if this piano is worth making good if it needs a little care and attention which I am prepared to do if I end up with a reasonably good sounding instrument that will last a long time if looked after. Yes it's underdamped and overstrung, but I can't tell you more than that -- I'm sure someone else will be along with more information soon. 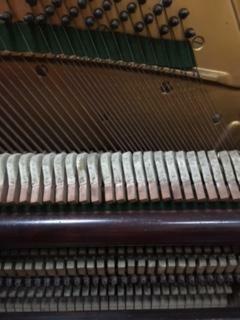 No 2nd piano bought privately can be 100% reliable and its "worth"/ rating/ name , unless an inspection is made first. The name in general is a good reference to start from, but it also depends on what you paid and condition. We know the approximate retail value of these pianos, so it's selling price may reflect on its condition. As a starter piano, I'm sure it will be fine, and with having the under-damped version, pedalling lessons in later years will be valuable. The overstrung aspect will be understood in years to come too..... assuming you have lessons? An inspection ensures the tuning pin torque/ stability, and also checks the hammers - one of the most valuable and expensive part of a mechanism. From one of the photos, I suspect some damp/ mould on some of the action parts which may suggest sluggish moving parts or the odd note not working intermittently (usually when pedalled), and some re-pinning may be required at some stage. 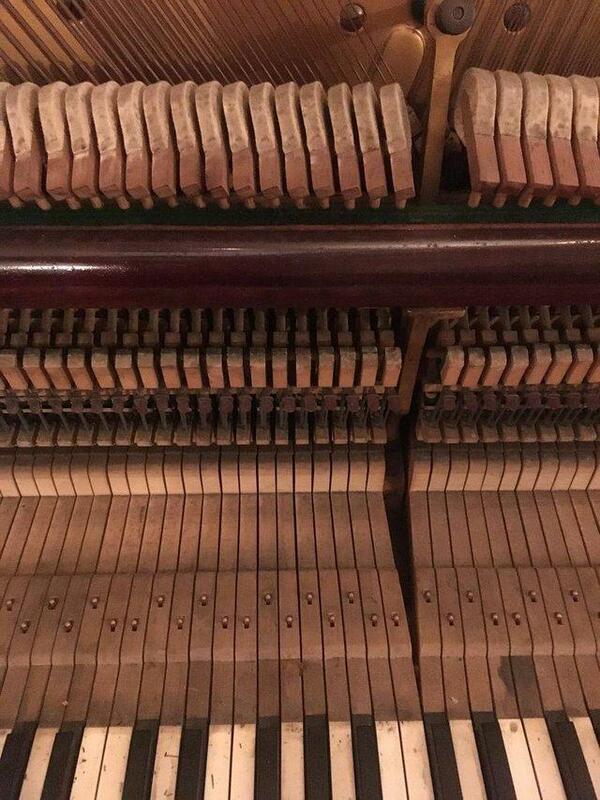 For the piano to last another generation, it would be recommended to have the mechanism refurbished/ new balance leathers, tapes, springs, reface hammers etc.... as damp tends to rot these parts then becoming dry, dusty and brittle. If all the notes work OK, that's a good head start. Tuning should be every 6 months, and servicing every 3 years. If you speak to any local piano tuner in your area (just Google "Piano Tuners in London" / example city), they will probably just charge a call-out fee for checking the piano over, so prices may vary depending on location/ for example, if you live about 20 miles away from civilisation (rural parts), you may pay more for travelling expenses. I myself charge about £45 for a local call-out/ unwritten inspection/ verbal assessment over the phone. For a proper full-on assessment (e.g. concert grand/ potential customer lives abroad), then a written assessment about £100.... so depends on what service you require. Some tuners may only provide a certain default service, so you need to ask. My website and package deals have nothing to do with this forum, nor reflected on what other technicians may charge.... so again, an inspection would be required first to assess the condition and level of repairs needed. If we know your location, we may be able to recommend someone local to you. My package deals & prices are a guide price only, and exclude UK carriage costs to and from the workshop. My own personal assessment would then steer you to the recommended package deal required.... so another piano tuner/ technician may have different subjects covering their work & different prices. Prices are estimated until everything is stripped down. Thanks Colin. I live in the back of beyond near Whitchurch on Shropshire/Cheshire border and there is a local piano tuner called Brian Viggars but don't know yet what other devices he offers. The Rogers piano I have enquired about is in Chester so some 40mins drive away. I will call Brian and ask him if he offers an assessment but other recommendations in Chester, if you know any, would be really useful. It's a complicated process...I'm beginning to wonder if I should just buy a digital! I'll keep pursing it though for now. Thanks so much for your advice. You are nearly there, so don't give up just yet! OK.... ring Brian (sorry, I don't know who he is or anyone else in your area), and ask for a quote, giving approx. distance. If he agrees, and you are happy with the price, then contact the seller for their full address and phone number.... then give this info to Brian. Ask the seller's permission if they mind the piano being checked over - if everything is genuine, they should not mind. Ask the seller where the piano is located.... should be ground floor/ normal access for a standard removal procedure. If they don't answer, then walk away.... seriously!! .... look somewhere else. After that, you may need to pay Brian in advance, then HE will arrange to contact the seller to inspect the piano. Can be a bit of a "triangle" affair, depending if they are out at work etc. When the inspection is done, Brian should contact you and give his verdict. The piano should be partially tuned to check the tuning pin torque, make sure you include this service - not just a general "eye ball". If Brian cannot do the work, perhaps contact the local piano shop in Chester? (Bucks Music I think) ...... they should have a tuner to do their tuning work - the owner may also be a tuner. If everything goes OK, then obviously pay for the piano, and arrange delivery. Ask the sellers if the piano is on a ground floor/ normal access. If in a bedroom/ down a flight of stairs, you may have to pay extra. You can go down the digital route, but be careful what you buy, as some digitals may not have parts available (unless new), even after 5 years old. I think the Rogers piano would be better. It is always advisable to find out Brian's email address, and email him the piano link - this should show photos of the piano, description and price. This will give him a rough idea before his visit. You can also send it here if needed. When I read pianos ads, I look at different things the normal punter would look at. For example, the photos you have included don't tell us much - no images of the whole piano/ keyboard/ panels on, and most of the photos are up-close. Some general photos should be included.... however, Brian should be able to spot anything untoward. Ok I will look into a tuner/technician and get it looked assessed. I just didn't bother to post them. Apparently all the notes work on the piano and the owner has had no problems there and the piano is on the ground floor with normal access...so far so good! 3. General historic movement of piano soundboard/ wrest plank etc. Depending on how good your ear is, you will start to detect it going out of tune.... could be just a month or so, and if lucky, could be a few months.... so this is what you will eventually experience when owning a piano. Obviously for a novice, you may not be bothered by the odd note going out of tune - it happens, but if you have a keen ear, often a deeper pocket is needed to call back the tuner about 3 or 4 times a year. 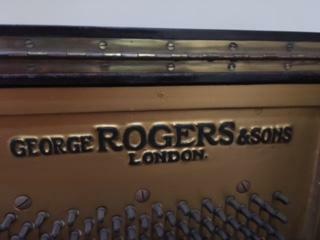 Don't forget that this Rogers piano is about eighty years old.... about forty years past its sell by date! ...... and if bought for a song, then we all hope you enjoy it. Best wishes.